This website is a useful tool for newcomers to grape growing and the seasoned viticulturist alike. 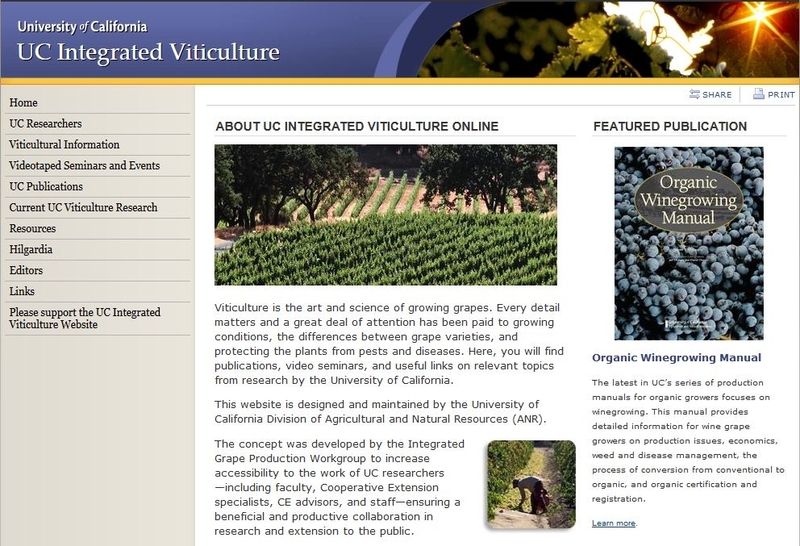 The information comes from the experts, the University of California Cooperative Extension Farm Advisors, UC Faculty, and others who specialist in grape care and maintenance. Since I reference the site so often, I thought I should take a second and introduce it properly and give a sort of virtual tour, if you will. So, let’s begin. From the home page you have access to a few different child pages, depending on what you’re looking for. Are you looking for faculty, farm advisors, and researchers with areas of expertise in grape growing or related pests, diseases, and practices? Head over to the UC Researchers page (the link second from the top on the left navigation menu). Curious about any recorded seminars that you can watch online? Check out the Videotaped Seminars and Events page for a list of topics with presentations to view online. For information on diseases and grape growing practices, you'll want to click on the link for the Viticultural Information page (pictured below). This page will take you to a list of topics pertaining to grape practices and diseases. Each of the items in the list links to either an article or another link of topics under that category. 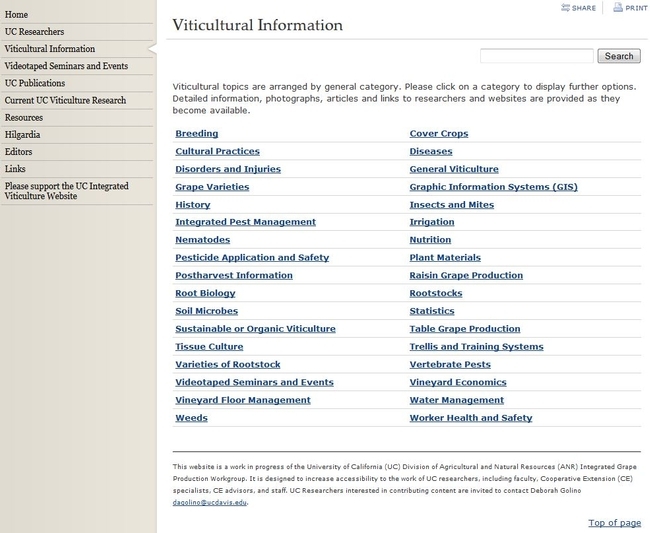 You can see a list of diseases that affect grapevines on the Diseases page (looking for more information on Grapevine Red Blotch or Leafroll? this is the spot for you). Interested in information on some of the different grape varieties out there? Try the Grape Varieties or the Rootstocks pages. There is even information on Irrigation, Trellis and Training Systems, and Vineyard Floor Management. Keep in mind that the left navigation menu can always be used to jump yourself back to one of the main pages, so don't be afraid to click around in the different categories. After you're done looking up information, you might want to take a look at the Editors page. Here you can see all of the Contributing Editors who have provided information to the website. You might also notice that I'm the Website Technical Manager, so if you have any comments or questions, please send them my way.